I have always been a deal-finder, clearance-rack, bargain-hunting shopper. It’s in my blood. Lately I seem to hear the words frugal, budget, and bargains more often than not. It’s the economy and people realizing that they need to take a step back and really analyse their finances, and I think that’s awesome. It makes being frugal more accepted. I grew up with a mom who had a coupon for everything. “Hey, Mom? I wanted to try this new shampoo, can I throw it in the cart?” Mom: “Well it just so happens I have a dollar off coupon, sure throw it in.” Seriously, she had a coupon for EVERYTHING! My sister and I used to get so excited to see the total on the cash register screen, and then have it drop by 20 to as much as 60, 70, 80 bucks and be amazed at what my mom ended up paying. It was a game for her, and she was good at it…still is. When I became a wife and had a household of my own to keep, I decided to get into couponing. It’s not easy, but it’s not hard either. I just takes a little bit of know-how and some clipping time and you’ll be on your way to saving hundreds in no time. 1. Coupons are found in the Sunday newspapers, and sometimes are delivered to your mailbox. There are several different coupon circulurs, but the most common are RedPlum, SmartSource, P&G, and sometimes a General Mills insert. You can also find them online. Try coupons.com. 2. You can make it easy on yourself by having a Sunday newspaper subscription. What I have found is that my local Dollar Tree carries the Sunday paper for 1 dollar! 3. Buy more than one paper. You will really find that you are able to save more when you have multiple coupons. It doesn’t seem worth it to cut and clip to save 25 cents on a can of beans – but it you have 4-5 of those 25 cent coupons and combine it with a sale, you can save lots. 4. Come up with a way to get organized. I have a coupon file that fits in my purse. I got it in the Target Dollar section a couple of years ago, but any sort of small file system will work. Label the sections – toiletries, paper goods, canned food, frozen, etc…then when it comes time to clip – you have a place to put the coupons and it’s quick. 5. Check out couponmom.com. She’s got local store deals and tells you what coupons to stack, and it’s free. There are also a couple of websites where you pay a subscription fee. Your biggest savings will come when you stack a store coupon or sale with a manufacturers coupon. Most drug stores also have rebate coupons that you can put towards your next purchase. For instance, today I went to Walgreens and bought a Gillette Fusion razor and Fusion shave gel. The razor was originally 12.99 and the get was 4.29. The razor was on sale for 8.99 and there was an in ad coupon for the gel for 1.99. I had a manufacturers coupon for $4 off the razor and $1 off the gel. I also had a $6 register rewards good towards my next purchase. My total was .99 before tax! It really does pay to do a little bit of research before you buy! Overall, if you’re interested in getting your grocery bill down and being able to purchase things you don’t think you can afford, give couponing a try! Leave me a comment if you have any specific questions about couponing or a personal success story! I’d love to hear from you! Western Washington Giveaway and Awesome Sale! For all those who are Western Washington readers, there is a very cool sale coming up next weekend. The company is Sassy Mei and they are a traveling chic boutique with everything you could want for baby, kids, and even mommy! I’m so excited to go check it out next weekend…hopefully my daughter can endure the 30 minute drive to Issaquah and back! Check out the website for vendors, times and directions. You won’t want to miss it! 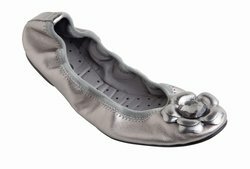 Also, Thrifty NW Mom is hosting a giveaway for a fabulous pair of Lindsay Phillips Ballet Flats. These are so cool, and will look good with anything! They also have interchangeable snap-ons that you can purchase to change up the look. These are a $69 value, so enter! Oh, and if you’re looking for great local deals, subscribe to Thrifty NW Mom! I can’t tell you how many great deals I’ve learned about through her great blog. Before discovering all of these thrifty crafty blogs, I never even thought to make my own version of some of these things. Now when I look through the pages, I see how many things can be made at home for so much cheaper. 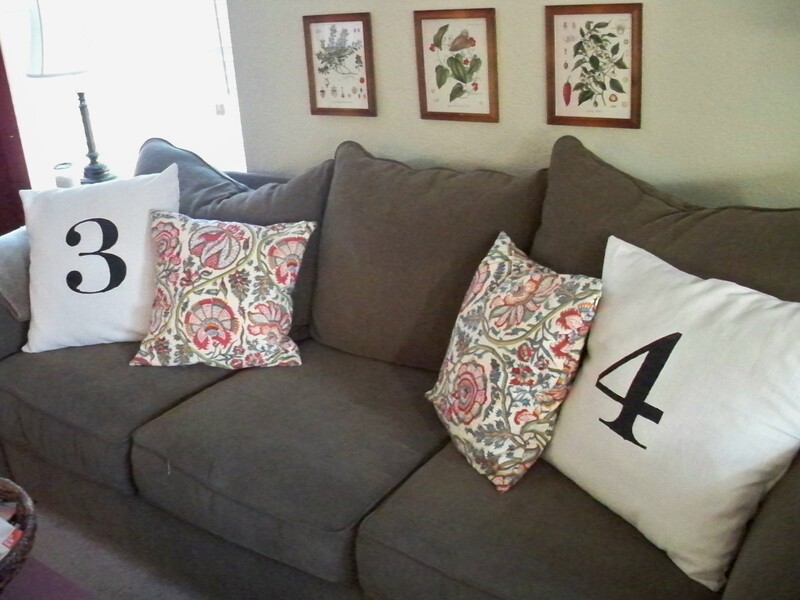 I came across Domestically-Yours tutorial on how to recreate these fun pillows. It took me about 2 hours total. $11.98 for the fabric – purchased at Joann’s with a 50% off coupon. Plus I have fabric left over to make some pillows for our bed! 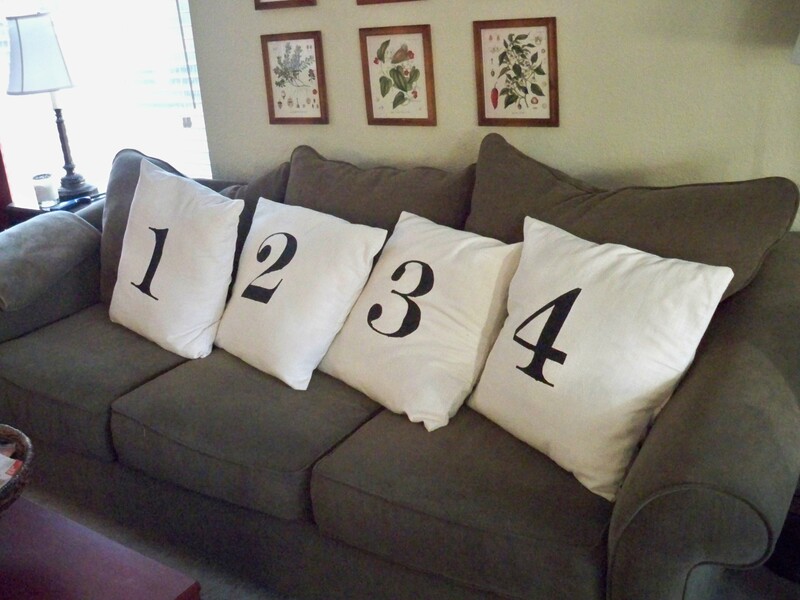 pillow forms – free…used existing pillow forms from couch. Total – $14.37! Feels good to save $84.63! There are a couple of things I did differently than the tutorial. I used the same font, but printed it at 800 size on legal size paper…that way I didn’t have to mess with enlarging it. I didn’t use freezer paper. I wish I had, because some of the paint did go outside the lines. I love how it looks with my new chest! So what have you seen in the catalog you think you could make on your own? Here’s my next project. Christmas this year was a little different now that we have a baby. So many presents! Crazy. Since we live in an 860 sq. ft. condo, space is always an issue. I’m trying to be very good about rethinking what I bring in, and always having a box to put things in to donate. I’m trying to live more simply. Having a kid makes living simply, well, really difficult! 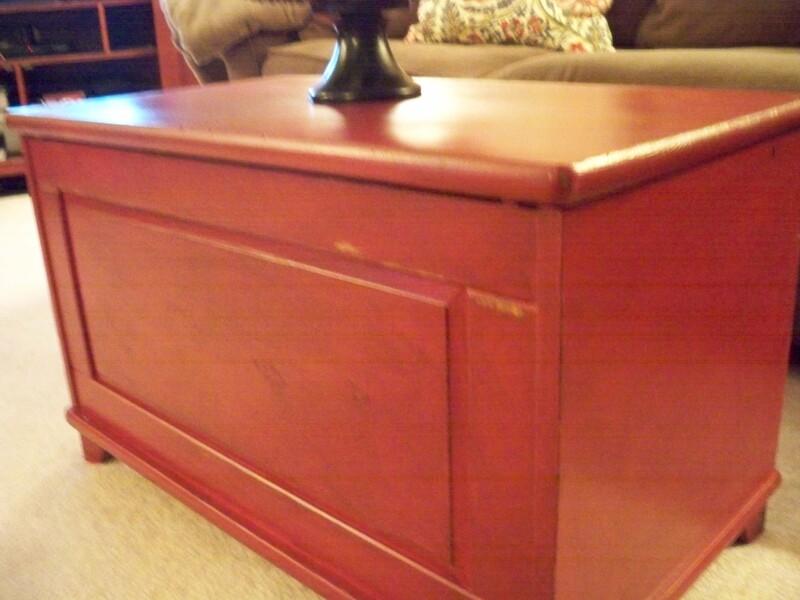 So the search began for a storage chest that could double as a coffee table. There are lots of options out there, but I couldn’t handle the ridiculous price tags. 80 bucks for a wicker chest at Target? Come on people. Finally I found this beauty on Craigslist. Got it for 40 bucks after waiting about a week for the lazy seller to meet up with my husband. Don’t you hate the wait that is Craigslist? AHH! 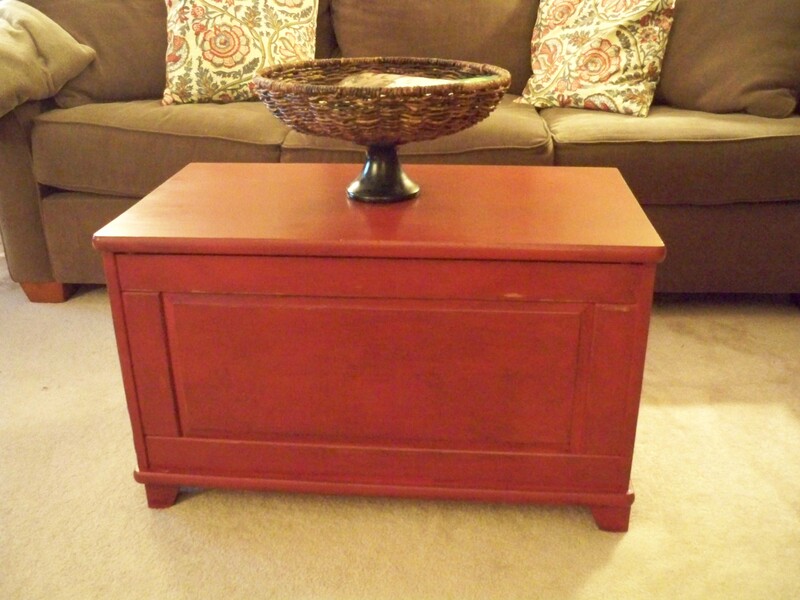 I decided to paint it a dark red, distress it oh so slightly, and then put an antiquing glaze on top. 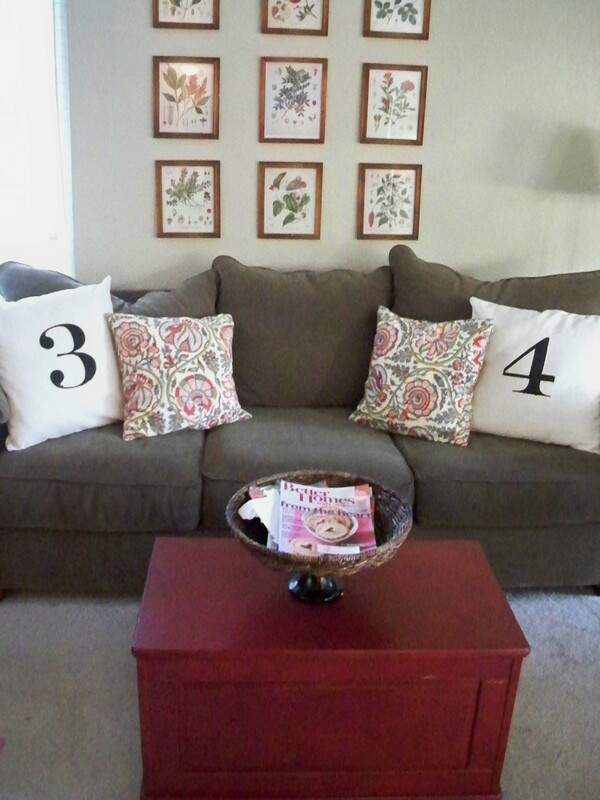 I wanted it to resemble something you would pick up at Pottery Barn, but for way cheaper! 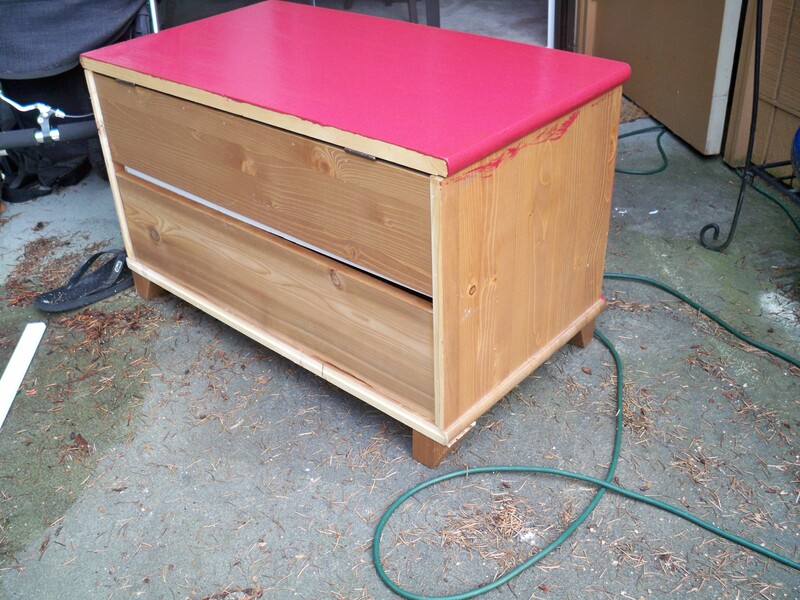 So I put about 2-3 coats of the red and let it dry completely. Then I took sand paper and sanded the edges. Some chunks of paint came off here and there, and that was ok with me. I wanted it to look worn – like it had happened over time. After distressing it, I applied the antiquing glaze. This was my first try with the stuff, and I have to say I’m pretty pleased with the way it turned out. I just used an old soft cloth, and applied it in a circular motion. It really gives it a deep, rich tone – and makes mutes everything. I love it! Oh and I bought it at Lowes. It’s the Valspar Antiquing Glaze and it was around 7 bucks…I have almost the whole bottle left too. You don’t use that much. What do you think? I’m really happy with it! The night I finished it, I went to bed thinking of all the other things I could glaze…my husband might just need to hide the bottle from me! Tidy Mom Valentine Recipe and Giveaway! How do you all feel about Valentine’s Day? 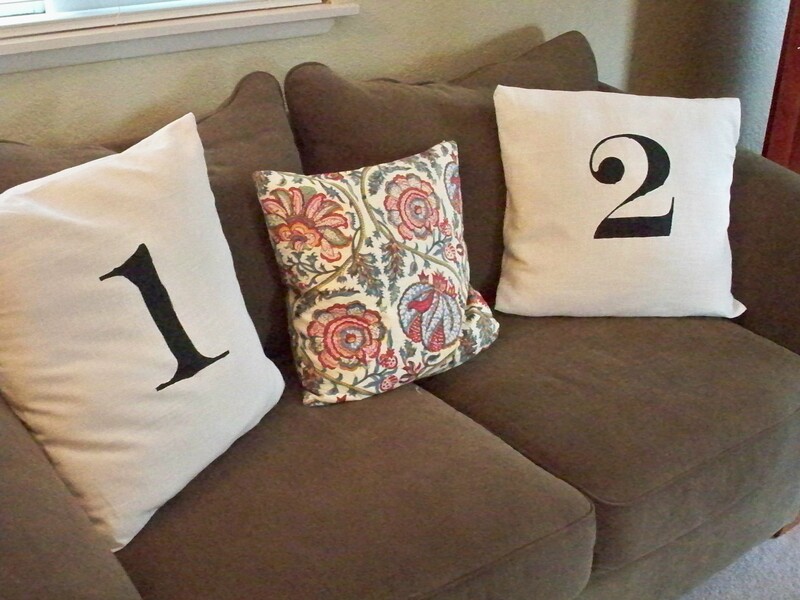 I’ve never been much of a fan…but there are so many cool decor projects and recipes out there in blogland! Have you seen this awesome felt heart wreath from the Idea Room? Or this why I love you pillow from How Does She? I’ve had to restrain myself from making our condo cluttered with pink and red. I think once my daughter is a little older, I’ll start decorating for Valentine’s Day. Whether you decorate or celebrate or don’t do anything at all, this recipe needs to go on your to-make list. I can’t wait to try it out for our Valentine’s dinner celebration. My husband loves cherry anything, so I think it’s going to be a winner. Plus we’ve both been trying to eat healthy…so a little indulgence is going to taste so good! Hop on over to Tidy Mom for the recipe and a sweet giveaway! Remember my recent post on soap nuts, and how cool they are? Well, here is a great opportunity to try them out for free! Enter this giveaway, and cross your fingers!